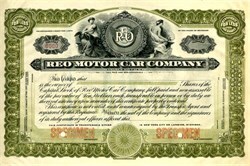 Beautiful Rare Specimen certificate from the Reo Motors Car Company printed around 1916. This historic document was printed by the Republic Banknote Company and has an ornate border around it with a vignette of the company logo between two allegorical woman. This item is over 100 years old. Beautifully engraved certificate from the Reo Motors Car Company issued in 1916. This historic document was printed by the Republic Banknote Company and has an ornate border around it with a vignette of the company logo between two allegorical woman. This item is hand signed by the Company�s President ( Ransom Eli Olds ) and Secretary and is over 91 years old. The signature alone lists in the Saunders autograph guide for $950. Reorganized as Reo Motors, Inc. share for share 1/2/40 Reo Motors, Inc. name changed to Reo Holding Corp.